Spring is a special season in the south. If you don't mind driving a little, you get to enjoy it several times. I feel fortunate to have spent so much of my life in North Carolina and Virginia. Both states have spectacular spring seasons. We once had some friends we made while living in Canada visit during spring in the Shenandoah Valley. They asked us why in the world we ever moved to Canada? Well Canadian spring was certainly not the reason. Back in the seventies we got a storm of over three feet of snow on our New Brunswick farm in early April. My years at college in Cambridge helped instill the love of spring in the Carolinas and Virginia. There is nothing better for your spirits than going from lumps of dirty snow to the beautiful pinks and greens of an Appalachian spring. Spring is definitely a time of quick weather changes even in the South. Weather can surprise you from morning to afternoon. The three weeks in the middle of March 2011 were absolutely fantastic along the Southern Outer Banks of North Carolina. Those three weeks ended with a fantastic series of days when the water warmed to close to seventy degrees. That actually sent me on my first fishing trip of the season. Not long after that we had an abnormally late frost which reached all the way to the water. I even saw the temperature drop over twenty degrees in a kayaking trip that only lasted an hour. Even a frost cannot destroy the feeling of spring once it is on the move. After a winter that brought some snow even to the coast, those mid-March afternoons with temperatures in the eighties were very welcome and quickly wiped away memories of winter. However, the warm temperatures finished off the blooms of our Bradford pear trees and even did in our daffodils. While spring comes with a flourish to the coast, it certainly doesn't have the explosion of color and staying power that you see in the interior of North Carolina and Virginia. Fortunately while waiting for spring to get its second wind along the coast, we planned a trip to Roanoke, VA which is nestled in the mountains about 5.5 hours of driving from the Emerald Isle, NC area. Our drive across central North Carolina into the mountain foothills of Virginia was stunning. We took one of our alternate routes which takes us through the farm country north of Hillsborough, NC and into Virginia at Danville. When we got to Roanoke that evening the temperature was in the sixties. I was pleased to see that our grass had been mowed right on schedule. However, that was the last we saw of the sixties in Roanoke. The next day our high temperature was 37F. The second day we managed to make it to 40F. We were there several days and never saw a high temperature out of the fifties, but cool temperatures can have an advantage in spring. They keep the blooms on the trees. We got to enjoy several more days of Bradford pear tree blooms along with redbuds and cherry trees. Even the daffodils in Roanoke were just hitting their stride. We left for the second part of our spring tour on Saturday, April 2. We took a route that seems to have defined much of my life, Interstate 81 to Interstate 77 and Fancy Gap. I have been traveling the area since before those roads were finished so I have seen about every type of weather the area can throw at you including some serious fog on Fancy Gap. However, even I was slightly surprised to see snow flurries mixing in with the rain as we headed out of Roanoke. The drive from Roanoke to Blacksburg on Interstate 81 south is often a special treat in the spring because the hillsides are covered with redbud trees. This year was no exception, and the drive up Christianburg Moutain was as pretty as one would expect. However as we got to Radford and Pulaski, spring became muted and close to missing in action. I think the cold weather of 2011 has kept spring in check in the high mountain valley south of Roanoke. If we can get back in another ten days to two weeks, we can probably catch it at its peak. Of course as you cross the New River near Pulaski and eventually again on Interstate 77 headed to Hillsville and Fancy Gap, you are beginning a gradual climb up the mountains until your reach the Blue Ridge Parkway where you start heading down the mountain to North Carolina. This stretch of road around Hillsville is one of my favorites normally. I love the huge fields and long vistas. Unfortunately most of the population of states north of us happened to be migrating south along Interstate 77 on Saturday, April 2. Traffic was so bad coming down Fancy Gap that it eventually became bumper to bumper. With stop and go traffic and speeds down to 20 MPH, it was hard to enjoy anything. We were headed to Mount Airy, NC, and being locals, we knew to get off at Exit One where we took the backroads into town. I was happy to see that Odell's is still in business selling Big Moe's. Spring in Mount Airy was farther along than it was in Roanoke, but it still not at its peak. We visited with a favorite older relative who had a birthday on April 2, and then continued our journey south to Cornelius, NC only stopping for dinner in Yadkinville, NC. My mother's family, the Styers, have been in North Carolina since 1790. My mother's dad was a miller, and she grew up on a millpond just a few miles from Yadkinville. Sunday, April 3 found us near Lake Norman, and enjoying spring at its peak. It is hard to describe a full blown North Carolina spring, but we experienced it on April 3. As we wandered the streets near our daughter's home, my belief that the true home of spring is in North Carolina was reinforced. From azaleas and tulips to dogwoods, we were overwhelmed with the beauty of spring in full bloom. It is a spring that I learned to love at our family homeplace in Mt. Airy, NC. Sometimes the ground under the tulip magnolia there looked like it had been covered by pink snow. April 3, I felt like I had come home for spring once again. We are now back on the Carolina coast enjoying the second stage of coastal spring. Even the wind that spring often brings to the area cannot diminish the beauty of the wisteria, azaleas, and dogwoods. We might have wind blowing into our inlet, but it is mostly a warm wind. Soon we will make our annual trip to Tryon Palace in New Bern to enjoy their amazing flower and vegetable gardens. Even there in the midst of amazing beauty, I will be yearning for the magic of the full blown spring like we recently experienced in Cornelius. It is the south, and it is the summer, but why is Roanoke, Virginia hotter than some piedmont towns that are usually cooking in the summer? The folks at Accuweather are proclaiming heat the winner this weekend. Many of the east coast cities are going to have their short cool springs end in a pool of steam. Having grown up in the south, I don't get too excited about heat even with these dire warnings from Accuweather. Humidity will add to the discomfort, leading to triple-digit RealFeel® temperatures. Heat advisories are in effect in New Jersey and southeastern Pennsylvania, including the greater Philadelphia area, and along the Eastern Seaboard from Virginia to the Carolinas. I just follow the rules of the South. The rules are get up early, do your outside work before the sun gets high in the sky. This morning I watered some sod that I planted a couple of weeks ago, sprayed some of our palms for rust, watered my tomatoes, and washed my truck all before 7:30 am this morning. It was plenty warm by the time I was done, but it was still a lot cooler than it is now. Kevin Myatt of the Roanoke Times is expecting some Roanoke records to break. Strong high pressure is building in, and this will give us several days of extreme heat for early June. We're talking mid to upper 90s in Roanoke now through at least the middle of next week. Record highs for each of those dates are, well, in the mid to upper 90s, all dating to the time period between 1914-1939. Blacksburg's daily records in the upper 80s and low 90s are likely in jeapordy as well. 100 degrees in Roanoke? It's not impossible we could scrape the century mark a day or two, and I thoroughly expect somewhere like Martinsville or Danville to have a 100-degree day before the middle of next week. These temperatures from Weatherunderground show Roanoke hotter than Beaufort, SC. Now that's hot. I saw a note that kids in Pulaski County are being dismissed two hours early because of the heat. I seem to remember that none of our schools were air conditioned back in the fifties and sixties. I can still remember the first air conditioner that we got for our home. It was a wonder. It cooled only our living room. Before we got that we relied on shade from trees, window awnings and screened windows. A wading pool or a nearby creek was of critical importance to those of us who were younger. We have become accustomed to our air conditioned cocoons, they will likely be mighty expensive this summer. Last summer we set our thermostats on 78 degrees during the day and 77 during the night. That worked pretty well, but we might have to inch them up this summer. Since I am down on the Carolina coast more often than not, the water is the most effect way to cool down. A few days ago I managed to do my first dip in the surf. Since I hardly ever manage to get over to the beach until after 5 pm, the air and the water are a perfect complement to each other. Those evening sea breezes don't hurt either. I am thinking the swimming pools in Roanoke will be busy this next week. It is hard to believe that Roanoke is hotter than Cornelius or Mount Airy. Cornelius which isn't that far from Charlotte often cooks. 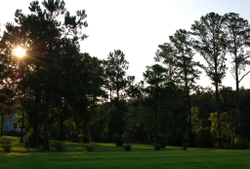 Pittsboro which is close Raleigh is often one of the hottest spots in North Carolina. I suspect we all are going to see the heat over the next week. Perhaps we can dodge the severe weather that often comes with it. Maybe it is time to consider that long delayed trip to the Canadian Maritimes where it was a sweater day instead of a sweat filled one. You can check out my Maritime Canada travel guide. The rocky shores of Nova Scotia are a good place to hide from the heat. Last night we went dashing up to Cannonsgate, a new subdivision on Bogue Sound. We were chasing sunsets again. The channel from their marina meets the sound at a great place to catch the evening sun this time of year. 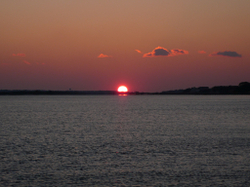 It is always beautiful watching the sun slip into the waters of Bogue Sound. Usually it is a pleasant experience, standing out there by the water as the sun drops down below the horizon. Last evening was a little different. It was cold and windy. I was looking for a place to warm my hands when I got back to the car. When I mentioned in an email last night that I was cold at 30 degrees Fahrenheit, someone from Memphis made fun of me because it was already 16 degrees there. Most people will agree that cold is relative. When we lived on the farm north of Fredericton, New Brunswick, I often worked outside without any gloves until the temperatures dropped below twenty degrees below zero Fahrenheit. It was something you got used to doing. Now I enjoy seeing what the temperatures are more than working in them. I have a long list of weather spots that I check every morning. Most of them are places where I have lived or traveled. Some are places where I wanted to live, like Deer Lake, Newfoundland, which I found to be a very charming spot in the early seventies, or Charlottetown, PEI, where I once opened a computer store for Datamaster when I was their sales manager. Other spots, like Mount Airy or Halifax are places where I have lived. Reston, VA, is a former work spot where I stayed so much that I felt like a resident. In the winter I even like to call some of my former neighbors in Canada to find out how much snow they have on the ground. I could just use this really neat snow cover map that I have found, but I also enjoy talking to old friends. Speaking of old friends, one of my college roommates who moved to Pittsboro, NC from Halifax, Nova Scotia, took off on a trip yesterday to Florida. We were instant messaging this morning, and he told me it was 19F in Cedar Key, Florida. If you want some reasonably priced orange juice, now would be a good time to run to the grocery store if it were not so cold. The best news that I have heard, aside from West Virginia beating Oklahoma, is that the cold weather will be over by Saturday. When temperatures along the North Carolina's coast get back into the sixties, I might get back into my kayak. I had no idea that Jimmy Buffet owned a chain of restaurants, but I am all for more meals in paradise. We might differ a little on where paradise might be found, but the thought is good and the wave sounds on the website are cool. Recently we were visiting the area north of Charlotte that includes, Huntersville, Cornelius, Troutman, and Mooresville. If you ever doubt that there is an explosion of growth in certain parts of North Carolina, wander on down to exit 25 or so and get in line to get off of Interstate 77. 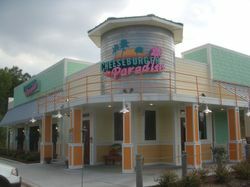 We had eaten at the Huntersville Cheeseburger in Paradise once before, but we all had cheeseburgers, and I wanted to wait until we had sampled the menu a little before writing this review. This trip I had the Carnivorous Habit Platter which includes Mini-Cheesburgers, BBQ Jerk Ribs, Teriyaki Wings, and Onion Six-Strings. I was lucky that my wife not only split her salad with me but helped me eat the platter. All of it was delicious. The next time we, we're both getting a salad and splitting the platter. My wife was especially fond of the Mini-Cheeseburgers. She got an Island Quesadilla which she found a little sweet. My youngest daughter got a Jerk Chicken Wrap which she claimed was delicious. I also got a sip of Beach Bum beer which was also tasty. All in all, it would be a nice chain to find its way to the Roanoke Valley. The closest one aside from the Huntersville location would be in Charlottesville. Cheeseburger in Paradise is one of the better chains that I have been to lately, they even had live music when we were there. If you want to visit a real beach paradise, check out my revised Emerald Isle, NC travel guide. It's only 5.5 hours away and as you can see from the pictures it qualifies as a special spot. I can even find you a really good cheese burger. Things have been tough for tomato lovers at our house and probably in many other homes in the Roanoke Valley. The crop has been slow coming in this year. Our plants were attacked by marauding deer and a fungus. 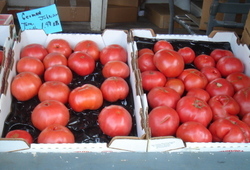 Good tomatoes were even in short supply at the end of last week at the Roanoke Farmers Market. In fact I was beginning to wonder if all the area tomato farmers had retired. Fortunately for us, we decided to take a trip down to Cornelius, NC to visit with our college age daughter who will hopefully graduate from UNC Charlotte by the end of the year. I'm not sure where North Carolina stands among states with Farmer's markets, but I'm convinced it is well up in the rankings of states with produce stands along the highways. After we had lunch at Lupie's in Huntersville, we came back and visited a produce stand that our NC-based daughter often frequents. 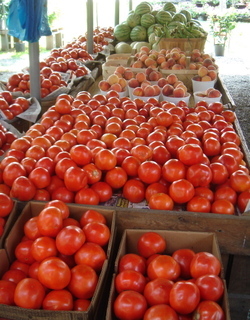 It's one of a number of Farm Fresh Markets in the Charlotte area. According to the owner they have been in business for years. The one we went to was at 19204 W Catawba Ave, Cornelius, NC. It is one the same side of the road as the K&W Cafeteria and actually you enter the produce stand from the road to the shopping center where the K&W is located. The easiest way to find the Farm Fresh Market is to get off of Interstate 77 at exit 28, take a right and just follow Catawba Avenue about 1.2 miles until you see the stand on your left. There's big "Out Parcel for Sale" sign. After scoping out the tomato varieties and talking to a couple of repeat purchasers, we actually decided to go with the German Johnson tomatoes pictured to the left. 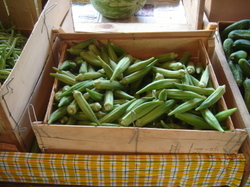 They turned out to be delicious as the main ingredient in our today's lunch BLTs. They were very meaty with very few seeds. Since we bought enough to last for most of the week, I'm looking forward to tomato sandwiches for dinner almost every night this week. They also might end up as the tomato plant of choice for next year depending on whether or not my Better Boys ever recover or not. We also came away with a Sugar Baby watermelon. After cutting if today, my wife said we should have brought two home. It was the best watermelon I've had since last year. For the rest of our thirty plus dollars, we got white half runner beans, already shelled Lima beans, and shelled Crowder peas. We got enough tomatoes not only for us, but also left some with the youngest daughter and sent some home with the oldest daughter. We'll freely admit to being a tomato loving family with the exception of our son, a tomato alien, who enjoys his strange lettuce and bacon sandwiches. 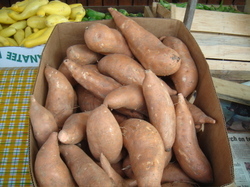 We did leave the Okra behind and forgot to try the Sweet Potatoes. 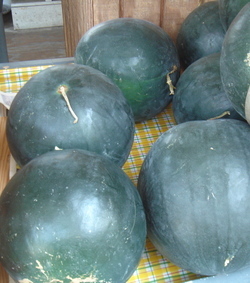 The squash, corn, and zucchini we can get at our local Jamison's Market. You just have to be on your toes to get there early enough to capture some of the corn. I suspect their tomatoes are close to being ripe by now. With all these great vegetables, I guess I'll be pretty choosy at the Roanoke Market this week.